"It's nice to have a third party saying, 'What are your goals? Okay, then this is what you have to do to get there.' So it's not just parents going, 'You need to get good grades, you need to do this, you need to do that.' You’re helping the [students] figure out what they want to do and how to get there." Emma F., a junior at West Anchorage High School, is one of my current college admissions consulting (CAC) students at Frontier Tutoring. 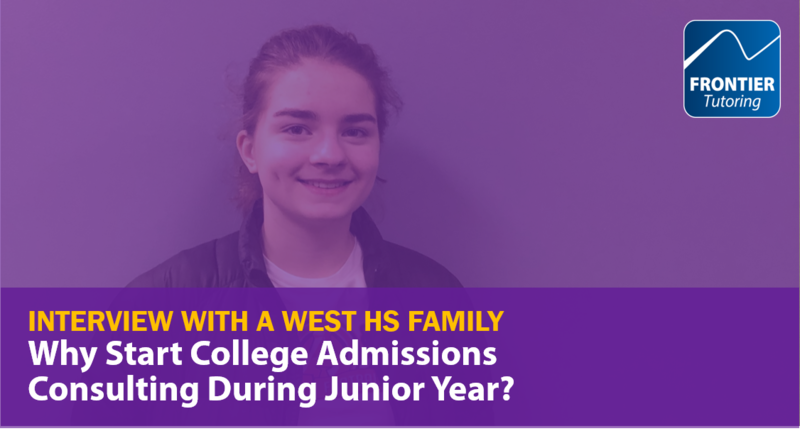 In this post, I share excerpts from an interview with Emma and her mom, Bhree, about why they chose to start college admissions consulting during Emma's junior year, rather than waiting until senior year. Responses have been edited for length and clarity. Use the links below to jump to the questions you're curious about. "Starting DURING junior year allows you to improve your COMPETITIVENESS. Starting AFTER junior year limits you to improving your NARRATIVE." 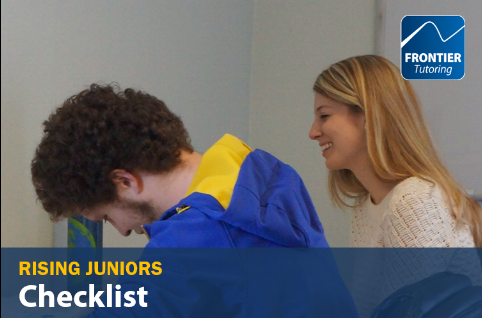 Many high school students and families I meet with wait until fall of senior year to think critically about their college list or applications—but for best results, students should begin planning for college admissions during junior year—the earlier, the better. Why? If you start planning for college admissions during 11th grade, you will have time to improve your profile and competitiveness (for example, by adjusting your coursework selection, improving your grades and test scores, initiating or enhancing your involvement in specific extracurriculars, identifying and deepening relationships with potential recommendation writers, etc.). On the other hand, if you wait until after junior year to begin thinking about college admissions in earnest, you will be limited to expressing the most compelling narrative about the profile you already have. To be clear, optimizing the way you tell your story and express your goals on college applications is critical—but you'll be even better positioned if your profile is more competitive to begin with. 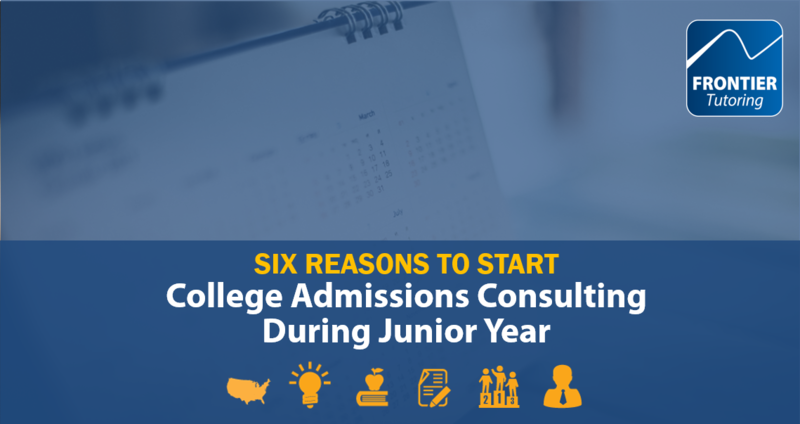 In this post, I'll walk you through six specific, high-leverage areas I work with on students when they start a college admissions consulting (CAC) program during their junior year. Also, I like the structure and the timing [of your CAC program]. For example, are we on time, or are we behind, and do I need to be stressing? I like not having to worry about that piece in particular." If you took the PSAT in October as either a 10th or 11th grader, you should have received your scores on December 12. What do your scores mean? How do they relate to the SAT/ACT? How does the National Merit Scholarship Program work, and what are the Alaska qualifying scores? And now that you have your scores, what should you do next? 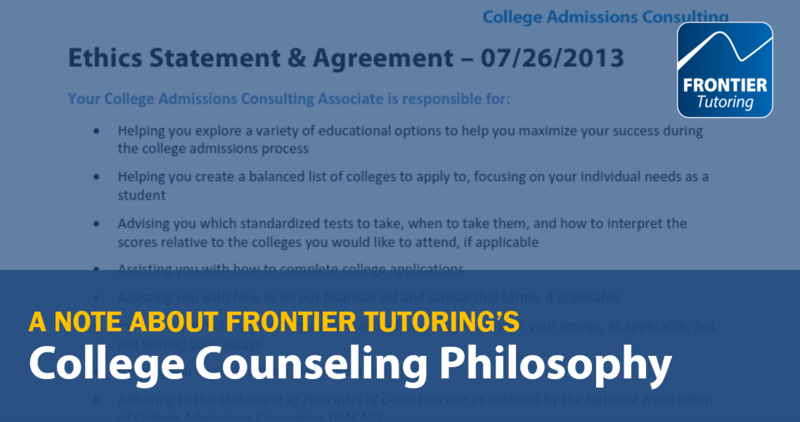 At Frontier Tutoring, we encourage every college-bound high school student in Anchorage to take advantage of our free practice SAT/ACT testing at the right time as part of their test prep strategy. And many do—last year, over 40% of Anchorage School District students who took the SAT/ACT electively signed up for a Frontier Tutoring practice test first. But why, when, and how, exactly, should you sign up for practice tests? We’ve put together a few tips to help you get the most out of this important resource and navigate the standardized testing and college admissions process. 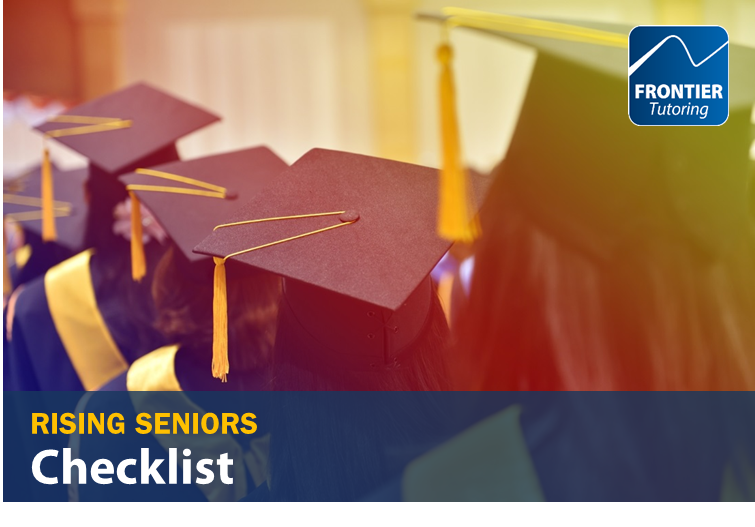 The checklist includes two essay planning exercises which many of our students have used as the basis for highly successful college application essays. Let’s get to work! An actual draft essay with feedback that T.D., a Frontier Tutoring college admissions consulting student, finalized for her successful application to the United States Air Force Academy, where fewer than 1 in 6 students is accepted. T.D. 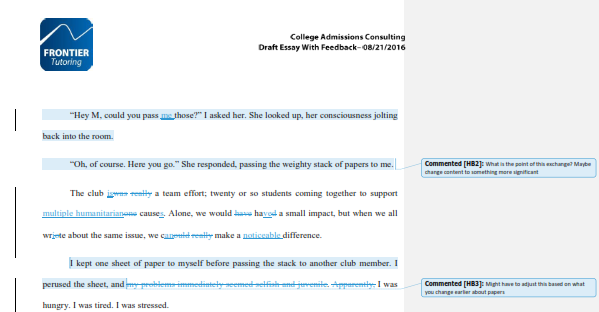 successfully adopted the Frontier Tutoring essay planning approach we introduce in this post. Ready to write? Let's begin! Get serious about your GPA: Depending on when you submit applications, the next two semesters will comprise the final grades colleges see. 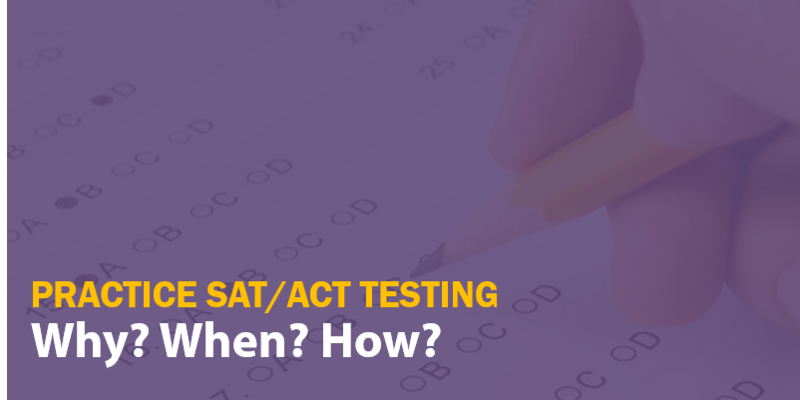 10th and 11th graders: If you’re like many students, your SAT or ACT scores will play a significant role in your competitiveness when applying to colleges, with 88% of colleges placing considerable or moderate importance on students’ standardized test scores for admissions purposes.1 Given the importance of your SAT/ACT scores, how should you develop your testing calendar and plans? 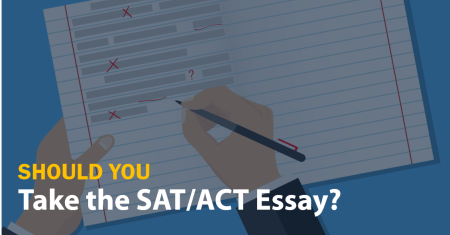 In this article, we’ll explore the best time to prepare for and take the official SAT or ACT—including whether juniors should consider the July ACT or August SAT dates, plus what sophomores should do over the summer to determine whether they may be competitive for National Merit recognition on their junior year PSAT. 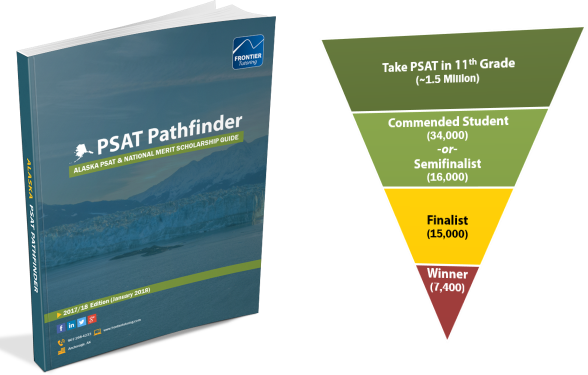 But first, let’s start with a high-level overview of SAT/ACT testing strategy.